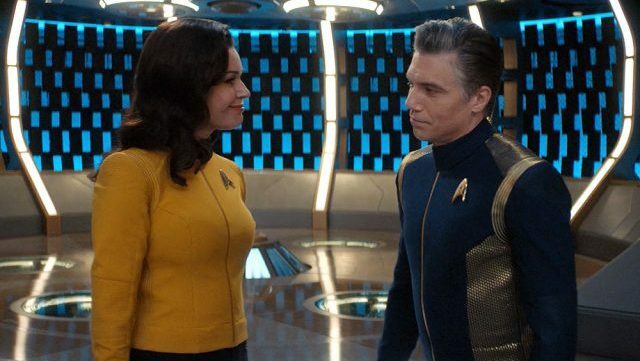 Following Star Trek: Discovery‘s renewal for a third season, Deadline reports that Anson Mount (Tully) and Rebecca Romijn (X-Men) are set to leave the series right after its season two finale. Mount and Romijin were cast for the second season to portray two of this season’s major characters, Captain Christopher Pike and Number One, respectively. Their sudden departure is due to the two actors only signing on for a one-year contract deal with the show. The last episode is scheduled to air on April 18. Star Trek Discovery is about the voyages of Starfleet on their missions to discover new worlds and new lifeforms, and one Starfleet officer who must learn that to truly understand all things alien, you must first understand yourself. In the end of the season one finale, it showed that the Discovery has finally encountered the USS Enterprise. Season two’s additional cast includes Ethan Peck as the iconic half-human and half-Vulcan officer Spock, Rebecca Romijn as the original Number One and Anson Mount as Captain Christoper Pike. Star Trek: Discovery Season 2 airs new episodes on Thursday nights on CBS All Access. The first six episodes of the season are currently streaming. The post Star Trek: Discovery: Two Major Characters Set to Leave After Season 2 appeared first on ComingSoon.net.